The Sydney look for in-stock synthetic lace front wigs is an easy wig to wear. ts ability to be heat styled means that you can try out different looks and thanks to being a synthetic wig, whilst you may spend on styling products, you won’t have to worry about caring for it. Though long it’s certainly not heavy and, being a straight wig, it’s incredibly easy to maintain and is suitable for a variety of face types. Oval faces by now know they can wear all lengths. For those of with round/heart shaped faces, this wig will help balance the width of the face. Though long lengths can make rectangular/square faces look longer, off centre partings (which can be achieved due to the freestyle parting) and adding waves or curls will counter this effect. The front is made from quality Swiss lace with machine made wefts in the back - can be worn in a ponytail and comes with small fine hairs at the hair line (also known as baby hairs). Free style partings mean that you can part it wherever you like. 20 inches in length with a medium density for a full but natural look. See our measuring guide for more details. 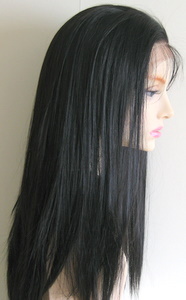 This is a silky straight wig, the colour of this wig means it’s great for all skin ones. The cap construction means it’s great for those who have growth hair as well as those who have lost their hair. The colour shown is 1B but if you’d like it in another colour you can contact us and we’ll arrange it for you.